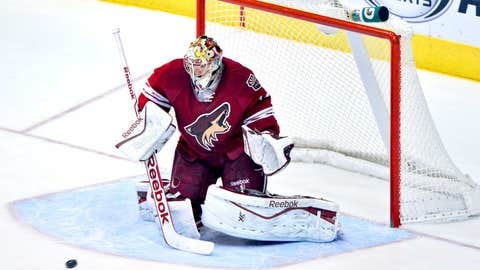 Coyotes goalie Mike Smith has won three straight starts against the Sabres while posting a 1.33 goals-against average. The Phoenix Coyotes would prefer to go into their Christmas break on a winning streak. The Buffalo Sabres just snapped only their second of the season. The Coyotes look to conclude their four-game road trip with a second straight victory over a struggling opponent when they visit the NHL-worst Sabres on Monday night. Phoenix (19-10-6) broke out of an offensive slump and snapped a three-game slide with a 4-3 overtime win over Ottawa on Saturday. The Coyotes had been limited to one goal in each game of the losing streak, but Antoine Vermette matched those three goals on his own against the Senators, scoring at 2:23 of OT to complete a hat trick. The former Ottawa player’s power-play goal with 2:13 left in regulation forced the extra session. The Coyotes have a good chance to keep it going against the Sabres (9-24-3) before the league takes a short break for the holiday. Buffalo has won back-to-back games only twice this season, the second streak ending with Saturday’s 4-1 road loss that closed a home-and-home set with Boston. The Coyotes resume play against the Pacific Division-rival Sharks next Friday, while the Sabres return to the ice the same night against the Leafs in Toronto. Phoenix could use another strong road performance from Vermette. The center is tied with Shane Doan for the team lead with 12 goals, nine of which have come away from home. Vermette has six points in his past eight in Buffalo, but this will be his first game there with Phoenix. Doan, meanwhile, will miss his eighth straight with what the team called a "form of Rocky Mountain fever," a bacterial disease that affects cells in the lining of blood vessels. "Our medical team is on top of it," said general manager Don Maloney. "Every day he seems like he’s getting a little better and a little more energy and has started to exercise a little more." Mike Smith was the star during the team’s most recent trip to Buffalo, making 43 saves in a 4-2 victory on Nov. 19, 2011. He’s won three straight against Sabres while posting a 1.33 goals-against average. Smith, who stopped 37 shots against the Senators, could get the nod against a Sabres team averaging a league-low 1.67 goals. "It’s tough to win in this league if you only have one line going and a couple of other guys and a goaltender," interim Sabres coach Ted Nolan said. "Especially with us, we need a little bit more." Buffalo, however, has recently shown some improvement by going 3-1-1 at home in December, including a pair of 4-2 victories in its last two. A win over Phoenix would give the Sabres their longest home winning streak since a five-game run from Feb. 19-March 12, 2012. Ryan Miller will likely be back in net after winning three straight home starts behind a 1.62 GAA. He’s also won all four of his meetings with the Coyotes, compiling a 0.99 GAA and one shutout, though he hasn’t faced them since Jan. 8, 2011. Jhonas Enroth, who made 35 saves Saturday, started opposite Smith in the most recent matchup with the Coyotes and stopped 25 of 28 shots. Marcus Foligno has two goals and one assist for the Sabres over his past two home games. He scored a goal, recorded an assist and got into a fight against the Bruins on Thursday for the Gordie Howe hat trick.